Economic Impact Of Harvey Could Be Felt Nationwide Before It's Over Hurricane Harvey has inflicted much human misery since Friday, and now its aftermath is causing economic harm. 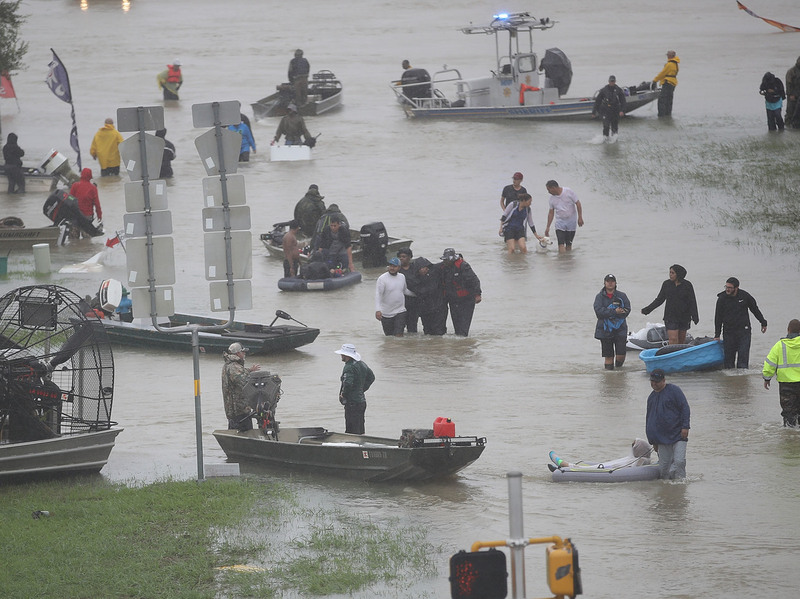 Experts say the flooding may end up damaging oil refineries and boosting gas prices. The damage to Houston's economy from Harvey's torrential rainfall will be by one estimate more than $30 billion, a staggering sum. Bill Gilmer remembers spending the night listening to the winds of Hurricane Ike tear through his suburban Houston neighborhood in September 2008. He also recalls waking up the next morning to hear something completely different. "The first sound I heard was chainsaws, and I looked out and all my neighbors were out there clearing the streets, clearing their yards, cleaning up their yards," says Gilmer, who directs the Institute for Regional Forecasting at the University of Houston's C.T. Bauer College of Business. Houston residents have survived big hurricanes before and know how to pitch in and help each other recover, Gilmer says. 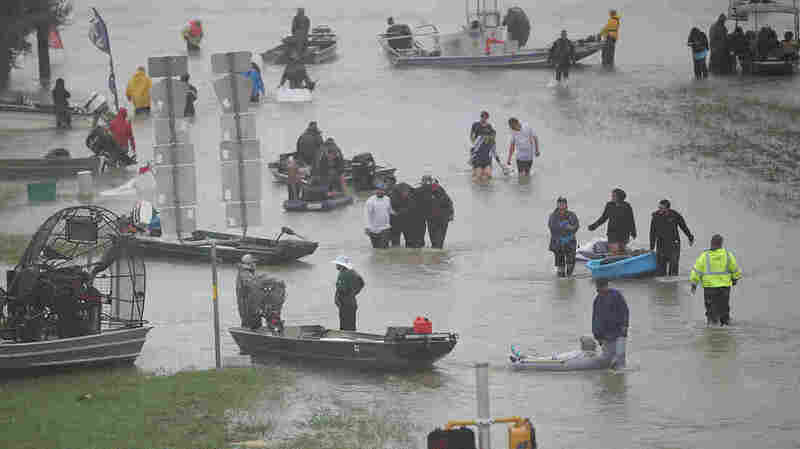 But the drenching rainfall that has followed Hurricane Harvey, flooding streets all over the country's fifth-largest metropolitan area, is out of scale with anything the city has seen before, he says. Chuck Watson, who studies the economic impact of natural disasters for Enki Holdings, says the cost to the economy from the flooding is likely to be $30 billion. That's because of the rain. "If Harvey were just a hurricane, it would have only caused $4 or $5 billion worth of damage. As a tropical storm phase, it's actually producing five times that much damage," Watson says. About a third of Houston's economy is directly tied to the oil and gas industry. But the region is also home to non-energy companies, both small manufacturers and large corporations such as KBR, Waste Management and the food service giant Sysco. Many of those companies have shut down in Harvey's wake, as have several hospitals, both major airports and the Port Of Houston. "You've got the fifth-largest economy in the United States basically sitting at a dead stop for three or four days," Gilmer says. Gilmer says the economy will be able to make up for lost time once the flood waters recede, but the physical damage to the city will be much harder to recover from. "In Houston you're going to have street signs, traffic lights, traffic signals, road damage, culverts, a tremendous amount of public infrastructure damage, and of course, there's no insurance. That just comes right out of the taxpayers," Watson says. It's not clear yet how many homes have been destroyed yet, but right now Watson estimates the cost of repairing residential properties will be about $12 billion. Most of that damage won't be covered by insurance, because homeowners' policies typically don't cover flooding. While coverage is available through a federal program, most people never bother to get it, says Loretta Worters, spokesperson for the Insurance Information Institute. Watson also worries about something else. Some of Houston's oil refineries are closed right now for a simple logistical reason: Streets are flooded and their employees can't get to them. The refineries aren't seriously damaged, however — at least so far. But the continued rain could end up flooding some of them, and if that happens there aren't enough companies with the kind of specialized knowledge to repair them. "Then you're talking about gasoline shortages and longer term price hikes, and that's going to have a ripple effect through the whole economy," Watson says. Investors are thinking about that too. At one point Monday, gasoline futures were up as much as five percent.